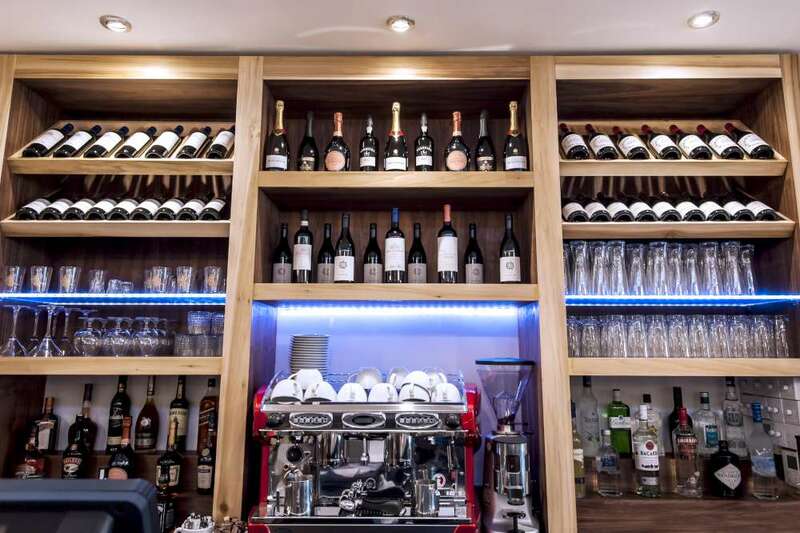 Tugra Restaurant offers a wide selection of alcoholic and non-alcoholic drinks, including fine wines, local and international beers, spirits as well as cold and hot beverages. Not forgetting, the extremely popular Raki. Our wines are hand-picked for their quality and you can ask your waiter which wines will complement your choice of meal. We only use fresh coffee and you can choose from a range of different types including espresso, flat white, latte. Of course, we serve delicious Turkish Tea and Coffee. A timeless Cuban infusion of fresh mint, lime juice and sugar muddled and topped with soda and rum. Peach Puree with House Champagne. 100% Organically certified. A superbly balanced wine, full of clean ripe fruit and a lovely textured finish. It matches perfectly with our grilled chicken. A bright, fresh and fruity Turkish wine made from the Sultaniye and Emir grape varietals. Soft and rounded on the palate. It goes well with everything! Exceptional Pinot Grigio from Northern Italy. Rounded with distinctive floral apple and stone white fruit flavours. It offers you such a flower field to be discovered, followed by orange blossom, bergamot notes and a crispy palate with remarkable consistency. Kavaklıdere Misket is a perfect aperitif for sharing and great with our grilled fish dishes. Great example of a Marlborough Kiwi Sauvignon. Perfumed with nettle ripe tropical fruits which are also evident on the palate along with limey flavours and a rich minerality - classic Marlborough Sauvignon. The wine is sappy fresh, clean and delicious. There are aromas of citrus and green apple; then the palate is broad and structured with more apple flavours, stone fruit, hints of lemon and a refreshing minerality. A beautiful wine, ideal with white cream dishes, fish & chicken. Very elegant wine with bright, with a streak of lemon zest and white peach that has a piercing feel, backed by light thyme and gooseberry echoes on the racy finish. Very pure and chiseled in feel. Complements any dish! Deliciously soft, light and creamy with lots of white stone fruit flavours. Great bubbly. Needs no introduction. Dry, flinty undertones silky in texture and a graceful everlasting finish. Popular, dry pink coloured Champagne with a bright, fresh salmon coloured tint. The ladies favourite. Yakut is a distinctive red wine with its expressive aromas very well balanced with its ripe tannins and with a good concentration. It matches perfectly with Lahmacun, Icli Kofte & Hoja Kebab. Award winning Cabernet Sauvignon showing rich, warming red berry fruit flavours. It goes very well with any lamb off our grill. Deep violet in colour with blue hues. The aroma is perfumed and complex - a combination of violets, sour cherries and oak spice. On the palate, it is concentrated with blackberries, ripe plums and tobacco leaves. Sweet, ripe tannins balance the fruit, and the finish is complex and long. It is a perfect match with any lamb dish! A complicated vintage, but with good results since there was an exhaustive selection of the grapes. A good balance between concentration and acidity in their youth define the wines from this vintage. Goes well with our tasty lamb chops or any grill off the bone. The thin, chalky soils of the hills express their rare terroir in this wine, which is rounded yet persistent, with a good minerality, making it great for relaxing at the end of the day and letting your mind run wild with thought and meditation. An intense garnet red colour with vibrant ruby highlights, and a nose full of dark fruits soaked in alcohol such as cherries, blackberries, violets and liquorice. It is a mouth lling round rose wine with its crispy acidity and persistent flavors. It matches perfectly with chicken and fish dishes. A fresh and easy drinking rose with strawberry aromas and further red berries on the palate. It perfectly match with light chicken dishes and fish dishes.